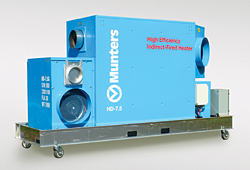 The HD-7.5 product line offers an energy-efficient advancement in indirect heating. Each unit comes self-contained, including a stainless-steel heat exchanger designed to keep products of combustion and moisture separate from conditioned air. A backwards-inclined centrifugal fan delivers air where it is needed. Its design allows customers to use the system with dehumidifiers or high-static blowers or as a standalone air heater.